But it wasn’t roses for everyone at RCR as Kevin Harvick, the only RCR driver in The Chase was caught up in a crash putting him nine laps down at the end of the race, and dropping 3 positions in the Chase. 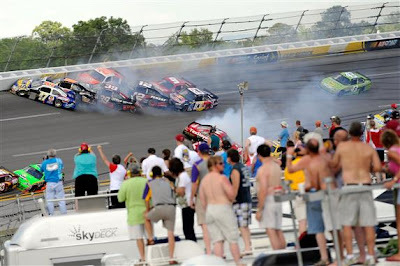 “It may have cost us the championship,” lamented Richard Childress, “We may have been able to ride in the back and wait it out, but that wasn’t what Kevin wanted to do. We had all of our sponsors here today. That just isn’t what we wanted to do.” Draft-partners, Dave Blaney and Brad Keselowski finished the race in third place and forth place with Vickers rounding out the top five. Anticipation is high at the Blue Oval with two Fords running high in the Chase. They want to be sure that Carl Edwards or Matt Kenseth claim the championship this year. It’s been a long time since 2004 when Kurt Busch won the championship for Ford. To that end, Ford let it be known that there would be no tandem-drafting with cars from other manufacturers. It made for a couple of awkward moments as when Trevor Bayne had to leave Jeff Gordon to hook-up with Matt Kenseth after Dave Ragan’s car broke. 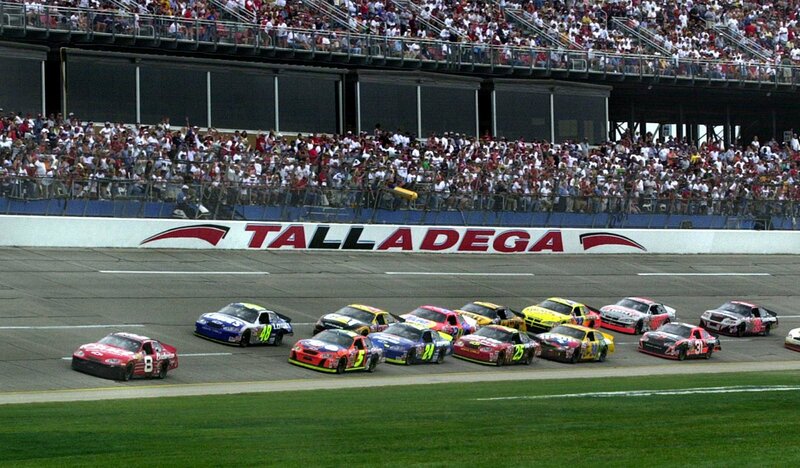 Kenseth and Ragan were running in the top ten all day with Kenseth leading 21 laps of the race. But after the restart with only two laps to go, something in Ragan’s engine blew leaving Kenseth stranded without a drafting partner. Bayne then ditched Gordon to help Kenseth. It was too little too late as Kenseth could do no-better than 18th. All was not terrible though as the 18th place finish was good enough to move him up one spot in the Chase. 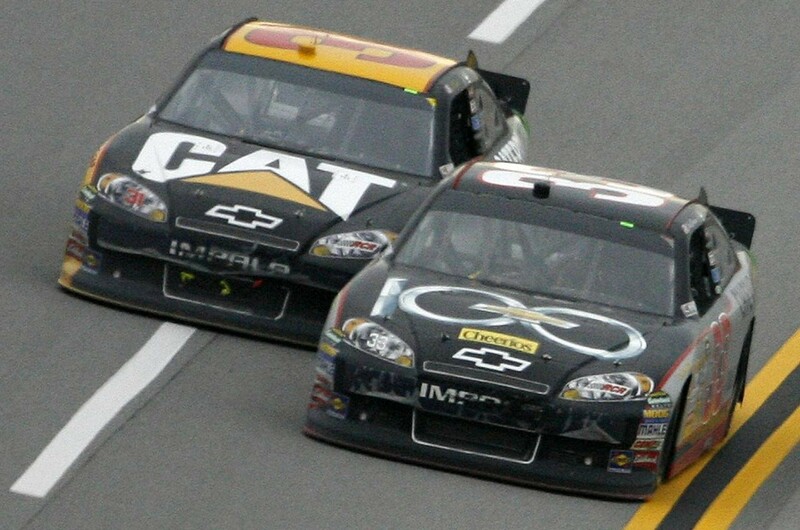 Carl Edwards remains in the top Chase spot with Roush-Yates teammate Matt Kenseth moving up to second place. With Brad Keselowski’s strong finish this week moves him up to 3rd place. 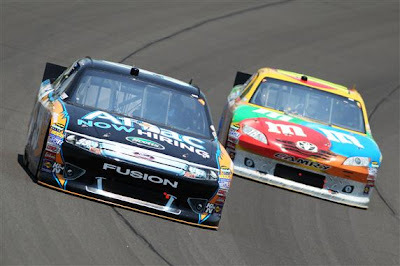 Tony Stewart is currently in fourth and Kevin Harvick in fifth place. Can Ford hold on for four more races? KANSAS CITY, KANSAS – Jimmie Johnson ran an impressive race this weekend beating out a hard charging Kasey Kahne by a tad more than ½-second. 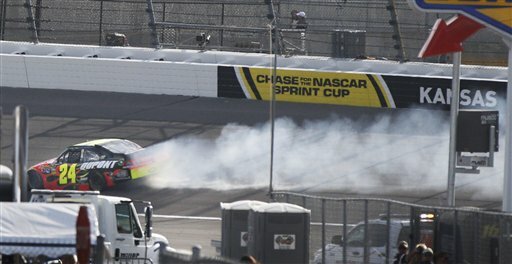 Johnson dominated the race and at one point had a 12-second lead over second-place Tony Stewart until a caution on lap 205 bunched him back with the pack. 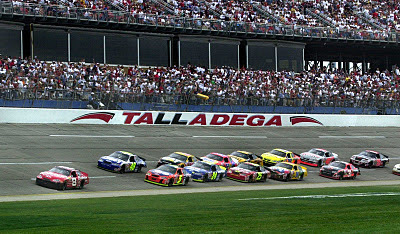 Then, while running a 2-second lead on lap 265, of a scheduled 267-lap race, teammate/owner Jeff Gordon blew an engine resulting in the final caution of the day. 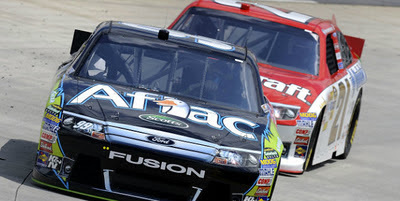 With a green-white-checker flag restart, Johnson stepped on the gas early causing Kahne to spin as he tried to keep up. Kahne took on 4 tires to Johnson’s two, but the surprise was all Johnson needed to assure victory. 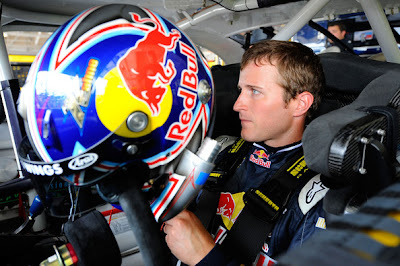 When Kahne’s crew chief was asked if Kasey thought he had a chance to win he said, "I didn't. I thought if maybe something crazy happened on the restart, if we could get beside him on the restart going into the first corner. B ut behind, I didn't really think we had much of a chance. He was so dominant all day. Even when he was on two [tires] and everybody else was on four, he would just be a little bit better. It was a long shot." Kahne has had a rocky couple of seasons. After a fall-out with Richard Petty Motorsports last year, he has been running with Red Bull Racing who recently announced their departure from Sprint Car. Kahne will be joining the Hendrick organization next year. His second place finish behind his future teammate may be a harbinger of good things to come. Jeff Gordon had a bad day – no question. Needing a strong finish, he was running in the top-five for most of the race. His car was running strong and handling well. "I started seeing smoke inside the car," Gordon said. "We had a really bad restart there and got shuffled back. Our day was pretty much over anyway and we were going to finish maybe 15th or something. Right there I started what smelled like burning oil and I saw the oil temp start to come up and I felt like it was just a matter of time before it blew up. I've got to thank Quaker State (a shameless plug) because the thing lasted a lot longer than I thought it would." 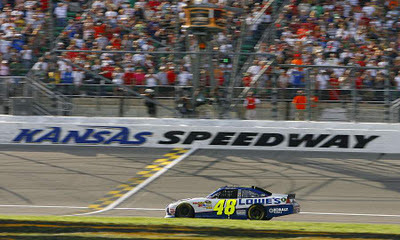 Due to the extra five laps, Gordon ended up 34th dropping to 10th in the Chase. The Chase is anyone’s game at this point. Following the Kansas race, Carl Edwards is only one point ahead of Kevin Harvick. In fact, the first 5 positions are within 12 points of the leader. This was Johnson’s 2nd win this season and only 4 points behind Edwards, he is a contender for a 6th consecutive championship. "We're doing the right things," Johnson said. "You just don't know. Sure, this is a huge, huge step in the right direction, but in six races a lot can happen. So I don't want to get overly excited. We've got to go out there and race for this thing." And who could miss Jaime Little from ESPN in the pits. MOHNTON, PENNSYLVANIA – Though rain-delayed, Jason Line had a perfect weekend at the Auto Plus Nationals. Not only did he win the race, he also qualified No. 1, and set the new national et record with the quickest run ever in a Pro-Stock Car. 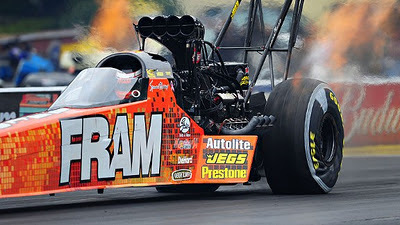 His Pontiac GXP went a 6.477 sec/212.79mph in the semi-final run on Monday morning. In the final round, he went against Ronnie Humphrey in his Genuine Hotrod Hardware GXP. Line’s 6.48 sec/ 212.79 mph run was good enough to claim the race. "That's the second time we qualified No. 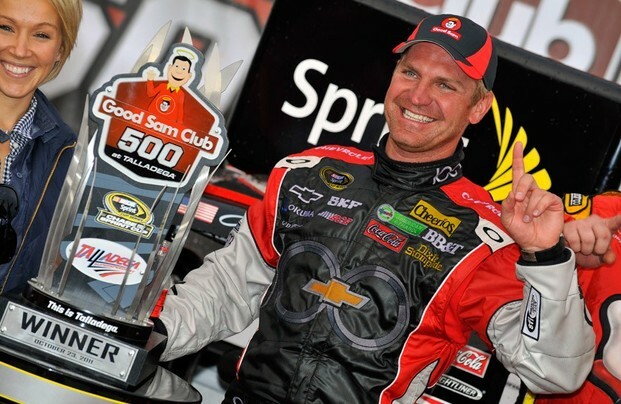 1, set the record, and won the race,” Line said. “It feels really good to do that because there is a very small club of guys who've done it. I like going into the last three races with the amount of points we have because it's not as much pressure. It's not over by any means, but I wouldn't trade my position for anyone else's." Line extended his lead in the Countdown over teammate Greg Anderson to 181 points. It was a bitter sweet Top Fuel final round for Del Worsham who ran the quickest run in NHRA history with a 3.735 sec/323.81 mph but lost the race to Spencer Massey. A quicker reaction time and strong performance (3.770 sec/323.12 mph) by Massey was too much for Worsham. "Alan Johnson and Del Worsham did an amazing job in the other lane to make their car run as fast as it did,” Massey said. “It makes it that much sweeter of a win, in a way, for the win light to come on in our lane with a 3.77. I saw his nose out there at about 200 feet and never saw him again until I looked over after the finish line." 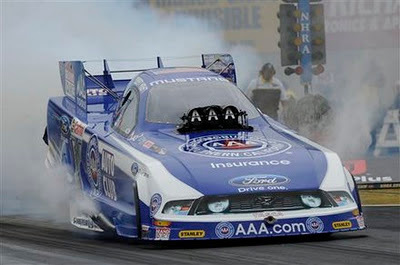 Massey is first in points with a 65 point lead over Antron Brown. In other interesting racing news, the Ben Bowbly-designed, Dan Gurney-built DeltaWing race car was unveiled at Road Atlanta this past weekend. Originally proposed as a single-seat spec racer, the DeltaWing, with added passenger seat, was proposed to the ALMS and Le Mans sanctioning boards. 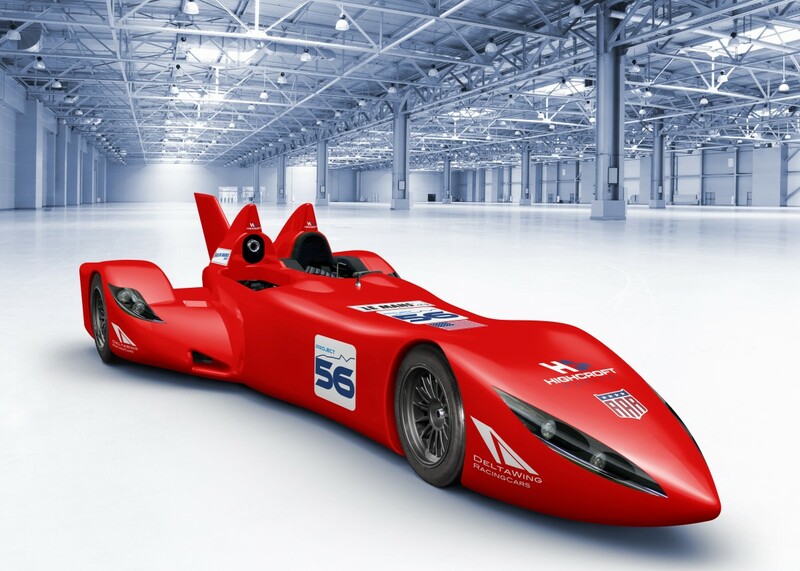 The innovative car was approved for competition as part of the “Garage 56” program which allows cars with emerging technologies to compete apart from the normal classes. The DeltaWing was designed to achieve maximum performance from the minimal use of natural resources. A special lightweight REAMS material supplied by Panoz is used for the bodywork. The car will be powered by a small turbo-charged 4-cylinder engine (supplier TBA) and will ride on specially designed Michelin tires mounted to 15” rims.